Human capital (read: your team) is the most valuable thing your company possesses. Companies with high levels of employee engagement are shown to be over 20% more profitable overall than other companies, and those that make their employees a top priority are regularly celebrated across all industries. That’s because at the end of the day, your company is only as strong as the people in it. The ROI of treating your employees as your most valued resource is significant — read on for three ways that an investment in your employees is an investment in the long-term success of your company. Your team members are the people who are most keyed into your culture — they experience it every day, and can provide valuable insight on internal processes that external stakeholders can’t. Empowering your people to speak up and voice their opinions is therefore essential to your company’s growth. Not only is this feedback loop crucial for leadership teams, but listening to your employees will help them feel valued, invested in, and understood in return. Of course, it’s not enough just to gather feedback from your employees: there should be documented evidence of management listening to and acting upon employees’ ideas and pain points. Whether you formalize feedback with quarterly reviews or regularly have brainstorm and collaboration sessions with your team to improve processes, make sure you keep a record of all employee feedback so that you can recognize trends and prioritize the issues and ideas that are most important to your employees as a whole. HR Stat #1: In a study surveying 530 workgroups with productivity data, it was found that teams with managers who received feedback on their strengths showed 12.5% greater productivity. The term “work/life balance” isn’t new to anyone — and according to Work Happiness Index 2017, it may be one of the biggest obstacles when it comes to overall employee happiness. The report shows that those with jobs that leave them too exhausted to enjoy the non-work elements of their lives — such as spending time with their partner or family — and those who “bring their job home” report substantially lower levels of well-being, regardless of how well they’re paid or how many hours they work per week. Promoting flexible work hours and better work/life balance may be the key to keeping your workforce happy and engaged. There is a common myth that remote work hinders workplace productivity. Particularly in the past few years, as trendsetters such as remote-work pioneer IBM have called their employees back to the office, companies have questioned whether flexible in-office policies are a smart business choice. Recent research tells a more positive story. In Gallup’s 2017 State of the American Workplace report, which surveyed whether or not employees would change jobs for benefits and perks closely related to their quality of life, 37% of respondents stated they would change jobs to have a flexible working location where they could choose to work off-site part time. Other surveys have pointed to greater productivity as a main benefit of allowing employees to work remotely — in one case, up to 91% of employees reported feeling more productive when given this option. Offering flexibility may be key to organizations’ retention strategies and help avoid costly employee turnover. For companies based outside of key business centres like New York or San Francisco, providing the option of working from satellite offices can be a huge HR benefit. This freedom will help to attract top talent and ensure that you’re hiring based on who is best for the job, not who is willing to relocate. Not only that, but employees will match the trust you place in them with greater dedication to their work and the company. HR Stat #2: Research from IBM suggests that allowing employees to work remote directly results in higher employee engagement (61% on average) than those in traditional working arrangements (55% on average). Consider your top-performing team members: are you taking the time to invest in their skills and chart out an attractive career path for them at your company? Too often, department leads can focus on difficult employees and forget to promote the growth and development of their best ones. This can range from small investments, like a monthly meeting to discuss goals to larger investments, like providing educational opportunities or sending them to networking conferences. If your employees know that you’re invested in their professional development and well-being, they’ll be more likely to stick around, meaning you save money on expensive recruitment processes and create a more stable work environment, which in turn boosts morale across the organization. There’s nothing like constant turnover to ruin the office vibes. This sense of connection, however, shouldn’t just be between the employees and the company. There are significant benefits to helping employees feel connected to each other. According to a survey by Clear Company, 86% of employees and executives blame a lack of collaboration or ineffective communication for workplace failures. 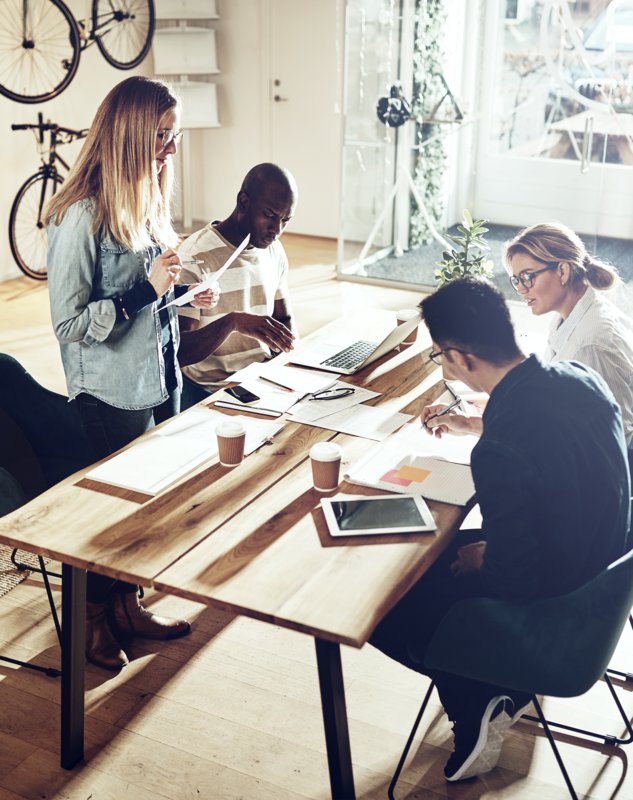 Employees who feel connected to one another are likely to seek out more opportunities for collaboration and gain a better understanding of each others’ communication styles and workplace habits. Uniting employees under common goals, regardless of their role, can help promote better workflows between teams and the ongoing exchange of ideas between departments — which will only make their output stronger. HR Stat #3: Recent studies suggest that productivity improves by 20-25% in organizations with highly-invested employees. It’s a fact: engaged employees are a financial asset to your organization. They can help you better understand your business, they’ll repay your trust with increased focus, and at the end of the day, they’ll also save you money and resources. How you foster this type of office environment is up to you, but the benefits are clear: treat your people as your top priority. It’ll pay off. Looking for satellite office space, or a venue to facilitate team bonding? Browse Breather locations in your city. Welcome to the infinite workspace. Our private offices allow you to work wherever, whenever and for as long as you want.